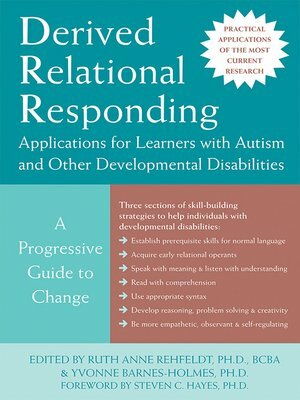 The first part of Derived Relational Responding provides step-by-step instructions for helping students learn relationally, acquire rudimentary verbal operants, and develop other basic language skills. In the second section of this book, you'll find ways to enhance students' receptive and expressive repertoires by developing their ability to read, spell, construct sentences, and use grammar. Finally, you'll find out how to teach students to apply the skills they've learned to higher order cognitive and social functions, including perspective-taking, empathy, mathematical reasoning, intelligence, and creativity. This applied behavior analytic training approach will help students make many substantial and lasting gains in language and cognition not possible with traditional interventions. Yvonne Barnes-Holmes, PhD, is lecturer in psychology in the Department of Psychology at the National University of Ireland, in Maynooth, Ireland.